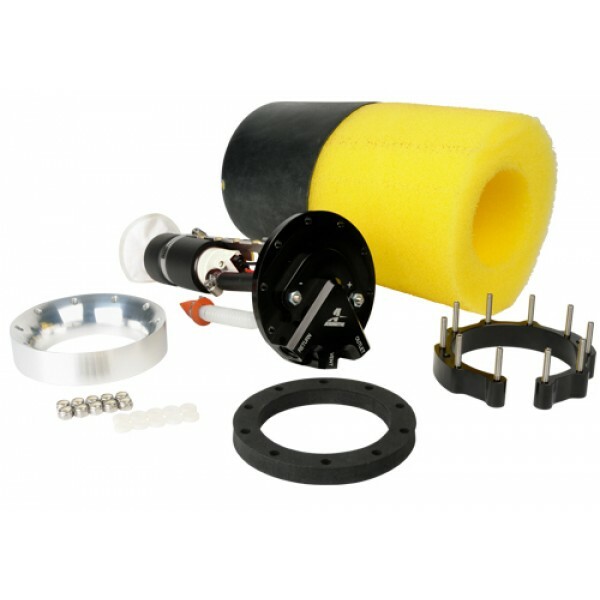 Aeromotive Phantom 200 Stelth Fuel System Fuel Pump and Foam Baffling, FP-18689 - Free Shipping For Online Orders Over $25! • Turbine pump mechanism increases durability. Considering a switch to EFI or swapping in that late model motor? What has recently become the hottest trend in hot rodding has been plagued by fuel delivery. The question is always, what do I do for a tank? Up until now, it’s been one of three options. Weld in a sump to your tank, go with a fuel cell or pay for a custom tank. Well, not any more. Aeromotive’s Phantom Fuel System gives you the option to put a high performance fuel pump inside virtually any fuel tank, including your factory tank. Simply cut a hole in you tank. Measure the depth. Cut you pump hanger bracket to length and your baffle / basket foam. Insert the baffle. Install the retainer ring and gasket. Bolt your pump and hanger down. That’s it. Now you have a fuel pump inside your factory tank capable of supporting big horsepower EFI or Carbureted and its whisper quiet. No more welding sumps or using up trunk space with fuel cells. No more hot fuel handling issues like vapor-lock and no more fuel slosh. The Phantom system’s internal baffle / basket controls fuel slosh and keeps the fuel pump submerged in fuel, even at low fuel levels and in aggressive driving. The best part about this whole system… its completely universal. This system will fit virtually any tank from 5.5” deep to 11” deep, plastic, steel, aluminum, corrugated or smooth. One system that gives you everything you need to fuel your ride. Its serious performance you will never know is there! • 200 lph high performance fuel pump • Supports up to - 450 HP EFI - Forced Induction - 600 HP EFI - Naturally Aspirated - 600 HP Carbureted - Forced Induction - 750 HP Carbureted - Naturally Aspirated • Black anodized hanger assembly • (3) ORB-06 Ports – Supply, Return, Vent • Fuel resistant baffle / basket (Includes: Foam and Bladder) • Universal high flow pre-pump filter • Modular design can be cut to height to fit almost any fuel tank • EFI or Carbureted • Turbine pump mechanism increases durability. • Must be used with a return style system • In-tank use only Considering a switch to EFI or swapping in that late model motor? What has recently become the hottest trend in hot rodding has been plagued by fuel delivery. The question is always, what do I do for a tank? Up until now, it’s been one of three options. Weld in a sump to your tank, go with a fuel cell or pay for a custom tank. Well, not any more. Aeromotive’s Phantom Fuel System gives you the option to put a high performance fuel pump inside virtually any fuel tank, including your factory tank. Simply cut a hole in you tank. Measure the depth. Cut you pump hanger bracket to length and your baffle / basket foam. Insert the baffle. Install the retainer ring and gasket. Bolt your pump and hanger down. That’s it. Now you have a fuel pump inside your factory tank capable of supporting big horsepower EFI or Carbureted and its whisper quiet. No more welding sumps or using up trunk space with fuel cells. No more hot fuel handling issues like vapor-lock and no more fuel slosh. The Phantom system’s internal baffle / basket controls fuel slosh and keeps the fuel pump submerged in fuel, even at low fuel levels and in aggressive driving. The best part about this whole system… its completely universal. This system will fit virtually any tank from 5.5” deep to 11” deep, plastic, steel, aluminum, corrugated or smooth. One system that gives you everything you need to fuel your ride. Its serious performance you will never know is there!